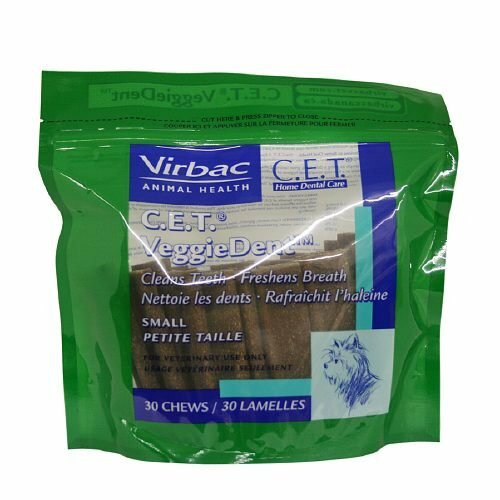 C.E.T.® VeggieDentTM Tartar Control Chews for Dogs are vegetable-based chews that work with a dog's chewing action to freshen breath, reduce plaque, and decrease tartar formation. Cleans teeth and freshens breath when chewed once a day by dogs. An independent study demonstrated significant plaque and tartar control in dogs when fed 1 C.E.T. VeggieDent Chew per day. C.E.T. VeggieDent Chews for Dogs are patent-pending, easy-to-hold, Z-shape design, and have a tough, chewy consistency. They are a highly palatable vegetable-based chew for dogs. If you have any questions about this product by Virbac C.E.T., contact us by completing and submitting the form below. If you are looking for a specif part number, please include it with your message. Well & Good Fresh Breath Puppy Kit, 3.25 oz.